New Barns - A Slow-Motion Catastrophe? Do the problems facing the New Barns and the Wimpy estates and the new developments in Wincanton at Lawrence Hill reveal we have a flawed and dysfunctional system of local government? Do we have a system where no-one sees the whole picture or accepts overall responsibility for the awful mess that is being allowed to develop here? This paper has been written by Nick Colbert (NC) and John Baxter for the Wincanton Window. While not always agreeing with each other we write with the intention of opening up what strikes both of us as a mess with many causes that are making it worse. We have tried to get our facts right, but to do so is not easy so be ready to correct us. We also ask you to read this carefully in the hope that you may get involved in some way to improve things. We do this feeling Wincanton's urgent problems are not unique. Spread across this huge and unwieldy county other communities are facing similar problems and are having to deal with the same confusing layers of bureaucratic responsibility. There seems to have been a nasty increase in crime and incidents of anti-social behaviour. As we have reported by no means are these confined to the two new housing estates, but we have had the smashing up of parked cars and the breaking of pub and shop windows and incidents involving violence and intimidation which have escalated into serious crimes. Despite the good work of our one local PC and our PCSO they do not seem enough to police Wincanton and the surrounding area. We also find the way police statistics are compiled is confusing. It appears anti-social behavior such as excessive noise and disturbance is not classed as crime but is filed separately from actions like breaking a window, which are criminal. This means it seems that if one evening a group's anti-social behavior escalates into crime it is recorded as a decrease in anti-social behavior. To sort this out and compile overall figures that would provide a clearer picture is, it appears, very time consuming. Then there is deployment. Over the weekends are there always police in the High Street around closing times? Surely given what has happened there should be. Now, just when crime and anti-social behavior appear to have spiked, the "rapid response" units have been moved to Somerton (without any prior consultation). It seems to take about 40 minutes to get to Wincanton and on one occasion I have been told that when someone reported a burglary at a building site the police car turned up 45 minutes later. On finding no one the police then said the informant was mistaken. She was however vindicated when the next day the builders reported the theft of tools and materials. Who is there to complain to when such things happen? I am told Sgt Ed Hawkins is in charge and the Cary and Bruton local officers also are based in Wincanton. New Barns. A Very Challanging Situation. Is it Destined to Get Worse? First we ask, why does this development exist? Under Labour projected population increases were, it seems, based on the years when the EU expanded and some 2,000,000+ (including many legal Polish and Portuguese) immigrants flooded into the country causing a housing shortage. That rate of influx has, however, not continued, but the high target set then for new housing appears to have remained unchanged. Why? NC tells me the SSDC target is proposed for 16,600 new homes by 2026 in the Draft Core Strategy. If adopted SSDC must build these and it gets a central government subsidy to do so – provided 35% are affordable or social housing. 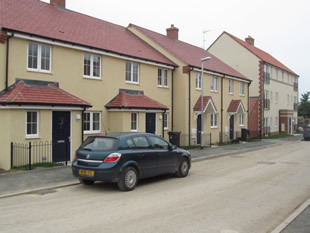 NC has found that "Jephson secured a grant of £1.4million from the Homes and Communities Agency (HCA) to be able to provide affordable housing on the first two phases of the New Barns Farm site and will look to provide 80 homes for rent, 14 for intermediate rent and 10 for sale through the Home Buy shared ownership scheme." To get this grant in time they have rushed into building these dwellings which are all placed together. So far NC tells me not a single private property (as provided for in Phase 2 of the development plan) has been built or sold. This leaves all the affordable housing isolated from the town and accessed through a Business Park, hardly a recipe to help the New Barns residents integrate into the town. Raglan on Wimpy and Jephson on New Barns are the housing associations which are entrusted with the task of placing people in these homes. It was argued by local councillors that these should go primarily to local people born or schooled here who needed such homes, but apparently that has not happened. Colin Winder claims that as regards New Barns he, as a town councillor, was told 25% would be reserved for locals but this has been denied by South Somerset District Council. Why? On the New Barns estate instead it seems many have been moved in from other areas in Somerset with no links to this area and it is being said many are long-term unemployed who have found no job opportunities here. Is this actually the case? NC also reports, "New Barns residents tell me they have complained to Jephson about some of the people who have joined them after the initial opening. (Councillor Henry Hobhouse asserts 70% are local people and there are only two families that have caused problems. He agrees Jephson have failed to screen effectively as they are bound to do.) Jephson have, it seems, said they have made some mistakes in screening and some people lied on their forms. Jephson have said it is not possible to evict people who lied on their application forms. Why?" A New Barns resident has told me they were all informed on choosing Wincanton that a new primary school was about to be built on the site and that they could expect a new children's playground to be provided. Now they hear neither are likely to happen. How and why were they misled? (Alison Tabor of Jephson says residents were told that a site for a new primary school had been allocated on the local district plan. What has happened to this is outside Jephson's control, but this was not made clear). What seems clear is that this precipitate building and settling in of so many needing affordable housing makes for a divided and isolated group of people who may find it difficult to build any sense of community. What will the unemployed among them do? 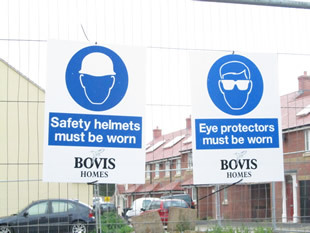 Clearly the danger is that these attractive and smart new homes may sink into becoming something much less pleasant. On driving around them it is depressing to note that Jephson, while apparently having responsibility for cutting the grass on the surrounding lawns and gardens in the very limited strips of public space, have done nothing and even as the builders pass by in their trucks it all looks uncared for and overgrown. 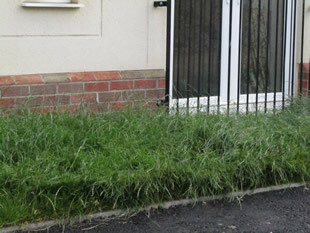 (Alison Tabor of Jephson reports that while tenants are clearly responsible for the upkeep of their own gardens, responsibility for cutting the grass and maintaining the gardens on unsold properties, communal areas and a strip of common land is divided between Jephson and the local councils and who will do what has not yet been agreed, so nothing has been done. Great). 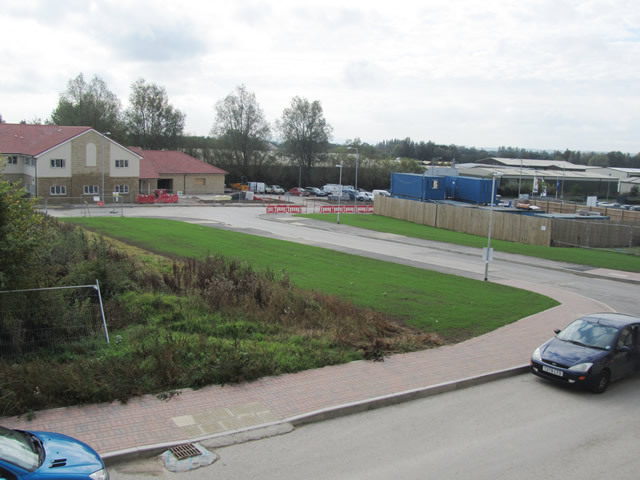 Nick Colbert reports, "The access road was to be from the top originally (ie from West Hill) but as the cluster at the bottom was built first, access was allowed through the business park as it was the only option at the time. Both Colin Winder and myself have pointed out time and time again that this is extremely dangerous and needs changing before someone (probably a child) is seriously injured or killed." Having driven around the area with NC and seen small children dodging around and between the unending flow of huge lorries in an area where Health and Safety demand men wear hard hats, I too fear that the situation looks like an accident waiting to happen. Access from West Hill should be an urgent priority. To make matters worse the Highways Department is, according to NC, expecting the property developer (Bovis) to come up with the full cost of constructing the rather elaborate intersection into West Hill that they have specified. Since they have yet to sell a single home this would place on them an enormous cost. They have asked for a temporary opening with the final junction being constructed as the site develops. Highways have, it seems, refused and have threatened to refuse any temporary access to West Hill while the properties are being built unless the whole thing is pre-paid. 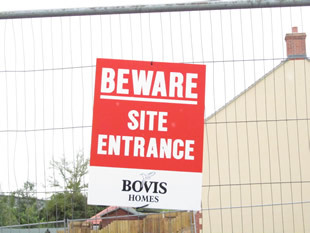 That would mean the builders would be entering the site from the bottom as they are doing at the moment. This would subject the residents in the affordable homes to what could be years of misery and danger as huge lorries trundle past them. Is NC correct in asserting this and if so, what is going to be done about it? The problems do not end there. As NC has said, "When the top opening is made a rat run will be created." In other words what he is saying is that if the intersection from West Hill is completed either in permanent or temporary form and the road past the new Medical Centre remains open, then those wishing to get to the A303 without going through the town's one way system will race through the estate. Again this would increase congestion and danger to children and pedestrians. NC suggests, "The only sensible answer is that when the top opening (from West Hill) occurs, which needs to be as soon as possible, the access through the business park should be walled off to prevent children playing amongst the business park's lorries and pickups. In the longer term my view is that a roundabout be constructed at the junction where Dancing Lane meets West Hill, and a road should be constructed leading South joining with the roundabout at the bottom which will be enlarged anyway to access the KFC/Marston Inn/Travelodge development at Lawrence Hill. 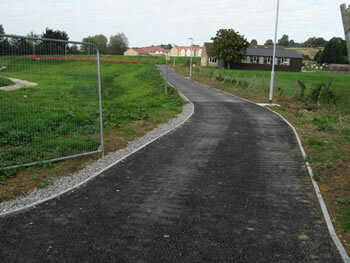 An access onto New Barns could come off this new road, without any problems. That would stop the current dangers posed by accessing a residential development through a Trading Estate, take traffic away from the King Arthur's and West Hill, take traffic away from the one way town centre system and provide an access to the farmland to the right as you go down the new road so when that is developed one day it will have a sensible access road." Getting funding for such a new road plan in the current dire climate strikes me as highly unlikely, however sensible. NC suggests we need help from central government, for it seems like a long term solution which has a lot going for it. In the short term if NC's plan for closing the bottom entrance to New Barns to traffic were adopted it would mean estate residents using footpaths to access the Health Centre, the Recreation Ground, Morrison's and the town centre, all but the town centre being pretty close by. If people really need or want to go by car all vehicle traffic would then access the site via West Hill, unless his suggestion of the need for a new road is taken up. Here is an issue where careful public consultation should take place before a decision is made. 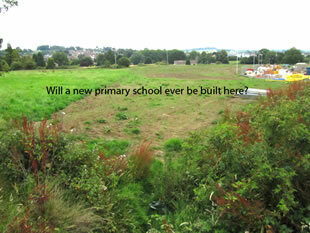 Will this be done or will a decision simply be made by a Highways bureaucrat sitting in Taunton? Local Government. Has it Become Inefficient, Arrogant, Bureaucratic, Costly and Unaccountable? As soon as anyone tries to find out who is responsible for what locally, we come across the fact that we are faced with three tiers of government. How does this work? At the risk of oversimplifying a confusingly complicated set up our Town Council has tiny powers and a tiny budget. As regards planning it only has the right to express an opinion. For the first time in many many years councillors were elected rather than appointed by each other. The next tier up is South Somerset District Council. Here members are elected and Wincanton has two councillors, Nick Colbert and Colin Winder. It is responsible for housing and has extensive planning powers either exercised by elected councillors or professional planning officers. It raises funds from the council tax and dispenses benefits from central government grants – many very specific. It carries out waste disposal and road cleaning. It has its headquarters in Yeovil and an area office at Churchfields in Wincanton. It has no authority over schools or roads. Finally there is Somerset County Council, the elected member for Wincanton and Bruton is Anna Groskop. This is based in Taunton. It covers a huge and diverse area. Schools – primary, secondary and FE, Social Services, Libraries and of course Highways. It employs a huge staff including a Legal Department. Avon and Somerset Police are separate and independent as are the courts, and the NHS has Primary Care Trusts, Hospitals and GP consortia, all currently – like the schools - being re-organized. The degree to which any of these co-operate with each other or other services can and does vary greatly. It will for instance be interesting to see what happens to the present Health Centre in the middle of the town when the doctors move down to New Barns. Will it be boarded up to rot as at Marston Magna or rapidly redeveloped. Who will be responsible? How does all this work? Often as an opaque, confusing, mess. Almost no-one understands the complexities that have developed (eg the car parks behind the Co-op are owned by the County Council, leased to the District Council and the toilets are the responsibility of the Town Council) and no-one takes overall responsibility for what happens. An example? Remember the tree outside the current Health Centre? (see WW) All three levels of local government were involved and no one was in charge. So far, after local cries of anger at the thought of cutting it down, the tree has been left alone, but for how long? Still, the tree was hardly an important issue compared to what is happening to our town now and the row that is to be anticipated will soon break out over car parking charges. Another example: Level crossings. South Street had one imposed on it without anyone in the District Council in Yeovil consulting the head teacher at Wincanton Primary or the residents in the area. The final decision was taken by the Highways Authority in Taunton. The result is less safe than the system previously in place where for 35 accident free years an excellent lollypop lady controlled children crossing outside the school. She also dissuaded parents from dropping them off to run across the road as now happens. Advantage of the new crossing? It makes the County Council less liable if a child has an accident outside the school. That now would simply be the parent's fault. Great! Another crossing in Station Road took five years of wrangling between all three councils before County Council Highways agreed to build it. 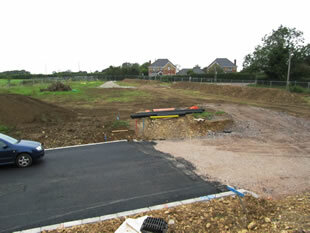 Then there are the developments at Lawrence Hill by the entry to the A303. Of these NC has this to say about KFC. "After preliminary negotiations had gone smoothly, the planning department suddenly announced its intention to refuse a planning application by KFC to come to Wincanton. This meant a £1,500,000 investment into our town providing jobs for builders, plumbers, electricians, landscapers, road and parking constructors and more, before we mention the 35 jobs in the KFC itself. What were they thinking of, or were they thinking at all? On finding this act of stupidity I telephoned Colin Winder and we acted to ensure the application would be approved subject to landscaping. The reason the planners gave for refusal was that the landscaping element hadn't been finalized to their satisfaction. It also turned out that South Somerset District Planning department had not replied to three consecutive emails from Savills, KFC's planning consultants. If KFC had got a refusal – the result would have been a probable 12 month delay whilst a costly appeal was heard or worse KFC going to Sparkford, Mere or elsewhere with the loss of investment and jobs to Wincanton." So what happened? It was eventually approved after KFC agreed to have two fewer parking spaces and a bed of shrubs one metre wider. Big Deal! Is that all? NC also reports, "The whole development, including the proposed Travel Lodge and Marston Inn has been delayed by Highways who have taken ages to approve plans despite being sent them originally last Autumn, and demands from the County's legal department for unreasonable costs despite an offer from the developer to pay any reasonable taxed costs with the money paid into solicitors in advance." As already mentioned several times in the WW and as a new councillor NC has discovered, when it comes to council business, be it town, district or county, there are strict rules to the effect that no councillor may raise an issue in public and express an opinion on it without losing the right to vote on it in council as the councillor is deemed to have created a "predetermination" by doing so. The thinking here is that if a councillor has publicly expressed an opinion he or she will not be prepared to change that opinion in the debate if faced with good evidence (!???). MPs are not restricted in this way. It is also asserted this makes corruption more difficult. How? It also becomes difficult or impossible to quote the opinion of any council employee. This NC came up against when after campaigning for less housing and more business land to be made available he reported that he had been successful in getting the numbers proposed revised down and more business land allocated but he was told that he shouldn't have made that public. Why? The Draft Core Strategy is a draft, the revision is a draft, the public had been informed of the former, why not the latter? His reaction? "Slapped wrist, yes but no regrets. I support open government." Clearly councillors need to declare any financial interest or involvement in a decision, particularly in a planning decision, but the present system seems to go far beyond that, muzzling real public discussion about issues in media like this and encouraging decisions to be taken behind closed doors or only at council meetings which, while "open to the public", will usually be attended by very few. What is more when votes are taken it seems no named individuals are accountable. Have we got this wrong? Please enlighten us. Is Something Wrong with the Three Tier Structure? It seems to me that the issues here are not party political. The District Council has a Liberal Democrat majority and the County Council a Conservative one. The problems are much more about a structure that encourages remoteness, arrogance and a lack of openness and accountability. NC says the council officers responsible for New Barns have told him they have never visited the site. If true that is outrageous. Is the same true of those who will decide about the link to West Hill? It seems we are faced with a long term problem, the three tiers of government and the size of the county. Many on both sides of the political divide have been arguing for Somerset to be a Unitary Authority or divided into two or three Unitary Authorities. As regards Wincanton some have suggested SSDC should be joined to Mendip DC as a Unitary Authority with full County Council power serving Town Councils with substantially strengthened powers, particularly as regards planning. Sadly, such a change could take years to implement, particularly if the restrictions on councillors expressing opinions which discourage openness and accountability are allowed to remain. So what now needs to be done right away? What steps need to be taken to stop the situation for the residents of New Barns in particular and other residents of the town from getting steadily worse? More responsive and targeted policing, and the monitoring of disruptive residents. Some may need to be evicted. Getting roads and access sorted sensibly after proper public consultation. Slowing down the allocation of affordable homes and encouraging and providing access to such homes for those with local roots. These seem to us the vital points. In addition if we are to promote openness and accountability we can make use of the Wincanton Window. It is there for all of us to contribute, so please make your comments and tell us what you think. Prior to publishing this article we have sent copies of it out a week early to what we may describe as "leading stake-holders": councillors (Town, District and County), the police, and Jephsons. We look forward to publishing their and your responses. I hope that in spite of the events on Friday night, people will want to work together and find a way to work together to make New Barns a pleasant place to live and come on to. I also hope that those living on the Estate will stand firm and inform Jephson and strongly push for those involved in these sorts of appalling acts to be moved on as quickly as possible. If we all work and act together then we can ensure these things are never allowed to happen again. Re: New Barns - A Slow-Motion Catastrophe? This whole artice appears to have been wriiten as a piece against the New Barns development. What about the kingwell Rise development off of Deansley Way. there is an access problem there with, i assume, a large percentage using Mundays Mead and Balsam Fields as a`rat run`, two estates not realy fit for the resients traffic yet alone any more. Both of these develpopements were passed by the Planners amd Highway authorities under LibDem control, which rather puts at odds John`s comment about who is responsible. Well I know that questions were raised by the Town Council, especialy over the accesss to Kingswell Rise, it was asked for it to be onto Bayford Hill. I think it’s only fair to point out that both John and Nick, who have collaborated (despite diverse political stances) to put this article together, went to some lengths to corroborate their facts. Given, as John says, the “confusing layers of bureaucratic responsibility” which surround all aspects of a development of this nature, writing this article was no easy task, but better to make a serious attempt than to ignore a situation which is such a current source of public interest. As stated in the article, Wincanton Window is keen to have the input of as many people involved in the project as possible, which is why it was sent out to interested parties a week before publication to invite any corrections and further relevant information. We’re still very keen to hear from any officials who’d like to comment or correct us, as well as the opinions of anyone not officially involved. It is not just the New Barns development that brings int question doubts about Local Govt.and (lack of responsibility) For some unknown reason the Planning Officer, straight form maternity leave, has seen firt to pass a planning application for a 3 bed house alongside 49 Mundays Mead. Given that this is on what can only be cosidered to be a 90degree `blind bend`, it begs the question as to WHY. It appears that not only did Highways say yes with-out even visiting the estate which is just what they did with the Yarlington application, neither did the planners.No doubt a visit was NOT expense claimable. On both counts the Town Council was against the application but was completely ignored. Nothing new there then, this IS Cinderella Town . Sorry, Area East. To compound this travesty a Cllr went against Town Council`s position and told the Planning Office that he did not object! Add this to my belief that on planning matters their own rules are there to be ignored, something I am positive I have seen to have been done. It would appear that the Planning Committee is either corrupt, incompetant or just so arrogant from obvious LibDem NON control over the last ? years that they think that they make decisions with impunity. Personaly I hope it is NOT the first, but there are enough feelings about for the former. I just wonder where it starts and stops. I, like the Editor, would enjoy seeing the excuses,, sorry (again) corrections. For a start I would like to see there findings to prove the NEED for this house. There are enough in Winvcanton that are lying empty, because nobody in their right mind would want to live there, and there are more than enough being built not to warrant one (1) extra where it is not wanted, but as I have already said, that means nothing to Area East. As for Highways, they are giving a wonderful impression of an Ostrich. According to them Mundays Mead is a residential Street with little traffic, they must be using `historiacal records`, it was built in the 50`s when hardly anyone had a car.Given that there is at least one car per household, little of road parking, and it is used as a "Rat-Run" from Kingswell Rise, Deansley Way and Greenway Close. 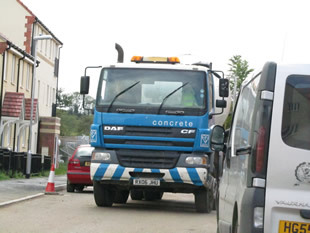 This does not include the HGV`s that use it for access. When planning was requested for Kingswell Rise, access onto Bayford Hill was refused by Highways, but no explanation was given. Makes you wonder.See, it is not just the "Public Servants", that is what they are,at District that are unaccountable, it is at County level, something that both will deny. But, why are the ELECTED Councillors ignored? Just what do they have to hide? Have a look at the Sports Centre article on here, it makes horrific reading, and Planning a minor event.